We drink a lot of lemonade in the summer so I am always thinking of ways to switch it up to keep it exciting. 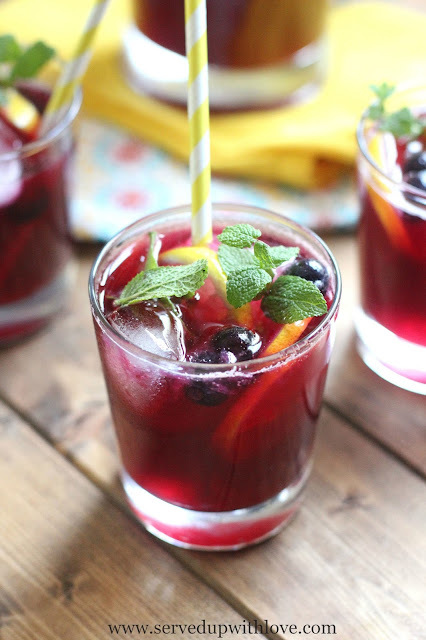 The addition of blueberries in this Blueberry Lemonade bring lemonade to a whole new level. I am rebelling and declaring that summer is not over yet. I am going to squeeze every little bit of summer I can out of these last few weeks. 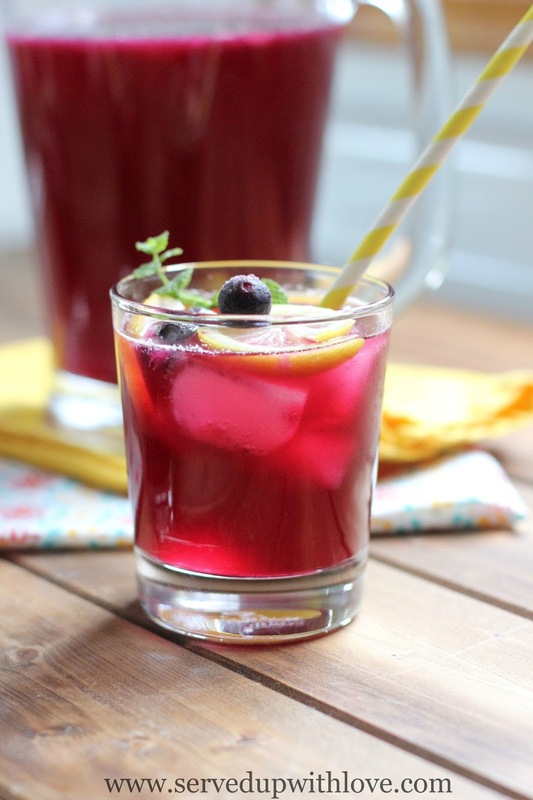 To make this blueberry lemonade, I start off by making my trusty lemonade recipe. I always have the makings to smoothies in my fridge and freezer for quick breakfasts so blueberries are always at my fingertips. Frozen berries are frozen at their peak of freshness and were perfect for this blueberry lemonade. My family goes nuts over blueberries so you can imagine this did not hang out very long in the fridge. This is one of my favorite ways to drink lemonade. (I think I say that about all of them) But seriously, this one is AH-mazing! Instead of making just any ol' simple syrup for this lemonade, I kicked it up a notch and added blueberries straight into the simple syrup. 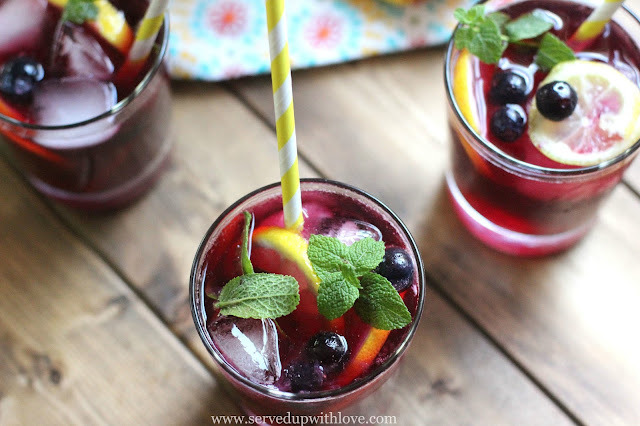 This infused so much flavor into this blueberry lemonade. My blueberry loving husband loved every last sip and kept coming back for more. That is usually not the case with him so I knew I had a winner on my hands. I even dropped a few frozen berries into each glass to help keep the blueberry lemonade cold without watering it down. Simply delicious! Make simple syrup by heating the sugar and water in a small saucepan until the sugar is dissolved completely. Add the blueberries, bring to a boil, reduce heat and simmer until blueberries have broken down, about 3-4 minutes. Drain the simple syrup through a fine mesh strainer. Set aside to cool. Use a juicer to extract the juice from 4 to 6 lemons, enough for one cup of juice. Add the juice and the blueberry simple syrup to a pitcher. Add 3 to 4 cups of cold water, more or less to the desired strength. Refrigerate 30 to 40 minutes. If the lemonade is a little sweet for your taste, add a little more straight lemon juice to it. 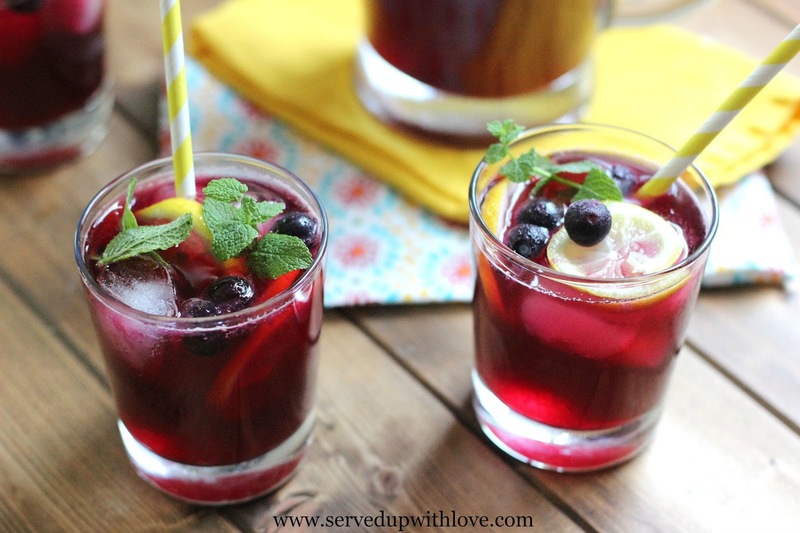 Serve with ice, sliced lemons, blueberries, and mint if desired. Enjoy! 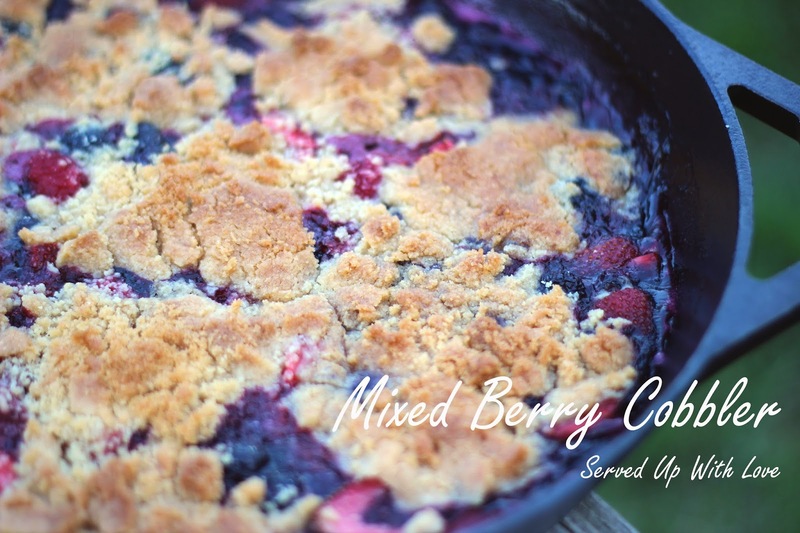 This looks delish and I am always looking for new ways to use my blueberries.